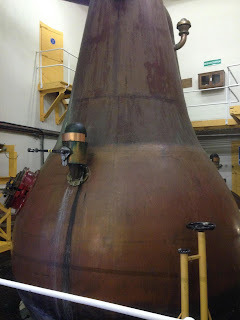 Hey guys, back with part 2 of the Scotchtrip, my first day in Islay. I'm sorry but it's a long one. 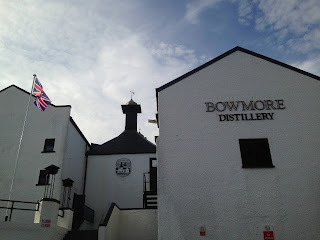 The first tour we did on Islay was Bowmore. The tour itself was great. 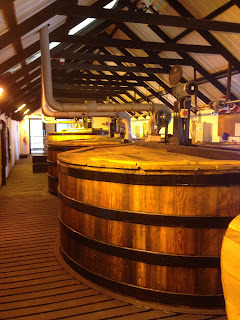 Bowmore have their own maltings, although they can only produce enough for 10-15% of the whisky. The focus of the tour was on how they've kept everything traditional, including Oregan Pine washbacks. This was interesting because we got to see a side by side comparison of different stages of the fermentation: after 1 hour, 15 hours, 30 hours and 48 hours. We also got a look in the warehouse and then the tour ended back at the tasting bar, overlooking the sea. We were given a dram of Bowmore 12 in a tumbler. A tumbler, wow, wasn't expecting that. Whatever. Pretty boring stuff, smelt of marzipan and I'd had it before. Then I asked to try the new batch of Tempest, I'd tried batch 4 and really liked it so was interested to try batch 6. Nose: Light and tropical. Mango, pineapple and melon. Water: Raisins and pastry. Marzipan and cinnamon after a bit. Taste: Light arrival, building spice and smoke, sea salt and white pepper ending on tropical fruit. Water: More peat. Cinnamon and marzipan after a bit. Finish: Medium length. Citrus fruit- Lemon. Notes: Not as good as batch 4. Then I spotted a bottle of the sherried Feis Ile. Nose: BBQ, wood smoke, raisin, red grape, meaty red fruit. Water: More sherry, musty with some damp dunnage. Taste: Intense, big and juicy. Wood smoke, meaty, red fruit, red grape, char. Water: More sherry and spice. Finish: Medium length. Sherry and raisin. After that cheeky number I popped into the shop to not spend my money and saw they had Gold Reef out to taste. Nose: Citrus and vanilla, marzipan. Taste: Soft and easy, some peat. Didn't buy anything in the shop. It's a shame because Bowmore can make fantastic whisky, it's just most of the time they don't. Onto Caol Ila. It's huge. Absolutely colossal. The mash tun is like a huge spaceship, they've stuck with wooden washbacks at the moment but they may be replacing them in a few years. Massive stills looking out onto the ocean with a control room that looks like it's been stolen out of Startrek. After all that we went out to the old abandoned cooperage. Which is really cold but that's where you do the tastings. You could choose two tastings out of the 12, DE or Moch. I'd tried the 12 so went with the DE and Moch. Nose: Sweet, barley sugar, white grape, lemon. Taste: Sweet, vanilla, white grape, peat coming through, bonfire. A little harsh spice- White pepper/ginger heat. Finish: Medium length. Soft and smoky. Nose: Fruity and soft. Watermelon, melon, white grape, lemon, lemon cake, vanilla, barley sugar. Taste: Again soft, fresh and fruity. Watermelon, lemon, soft peat and building bonfire smoke with a little ginger/white pepper heat. Finish: Short/Medium length. Fresh smoke with a hint of salt. The Moch took me by surprise in that's it not bad. They also had some barrels for a premium tasting and I asked. The guide replied that the sherry cask was terrible so they might be throwing it out. A bit cheekily I ask whether I could have some. Nose: Sulphur, sherry, Heather smoke, more sulphur over time. Water: More honeyed and floral. Old wood and raisin. Taste: Sweet arrival, sherry, spice, Heather smoke, pepper, then sweeter again, brown sugar. Water: Old wood and floral spice. Then more alcohol and a bit of harsh spice. Finish: Medium. Sweet sherry and sulphured smoke. Notes: Not too bad, the cask's just gotten the best of it. I quite liked it. Stumbling back into the car I realised I hadn't spent any money again. What a result! Bunnahabhain was just round the corner, so there next. Good tour with a guy who kept slapping his palm with back of his hand to emphasise important points. Wooden washbacks again and the ridiculous shape of the spirit stills give an oiliness to the spirit, but the distillation is done based on time (fast basically), which I think can make the spirit quite harsh. At the end we went back up to the shop for a taste of the 12 (which I've had) and the Toiteach. Nose: Grassy and oily. Oily peat. Taste: Oily with building mineral development. Harsh alcohol and pepper. Finish: Medium. Oil, some smoke. Notes: Very oily, very harsh, very Bunna. Didn't end up buying anything at Bunna either, except for a miniature of Deanston 12 that I've wanted to try. Sorry it's been a long one. If you made it this far, well done. Up next: Part 3: Laphroaig.